We didn’t have to choose. 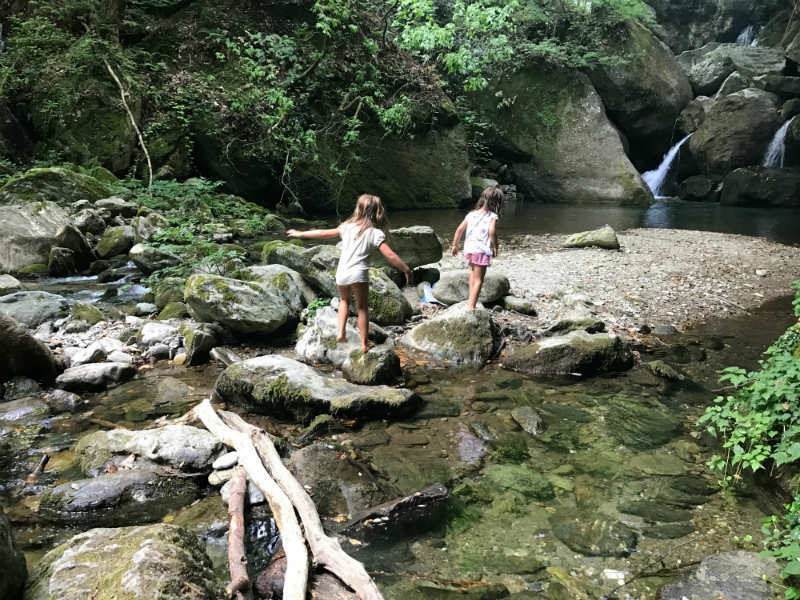 Pelion is a place where we have found everything: pine-tree forests with waterfalls and water springs, long sandy beaches, villages with traditional architecture and beautiful squares in shade of thousand years old plane trees. Olymp Gods use to spend their holidays in Pelion. Pelion is rich in myths and history, so this is the place where gods of Olympus resided in the summer and Jason and the Argonauts went in search of the Golden Fleece. We had no ambition to find fleece, we were happy to find great food and peace. Perfect place to stay and explore Pelion is Greek family hotel Hotel Farros, located on the hill above the most beautiful beaches of east Pelion – Mylopotamus beach. Hotel Farros has its own rocky beach with a natural shade under olive trees, but you can access the main beach either swimming or walking 5 minutes, through earthen paths. For someone who is looking for peaceful holidays, this is a place. They serve breakfast and dinner on the sea-view terrace, using diaries, vegetables, and fruits from their organic farm. Owner Yasmine makes the best Tztisaki we have tasted in Greece and she was generous to share her secret recipe. Hotel is surrounded by olives and orange trees and they let us pick as many oranges as we can eat, and that was a lot. We visited 9 villages in Pelion area (Makrynitsa, Tsagarda, Millies, Kissos, Vizitsa, Mouresi, Portaria, Agios Dimitris, Zagora, and Agios Ioannina) and they are similar to each other, but each has authentic atmosphere and charm. When you enter someone’s house you take off your shoes. When you enter Makrinitza you leave your car at big parking in front of the city and keep on walking. All streets in Makrinitsa are pedestrian and cobbled so it was very relaxing to walk around with kids. Makrynitsa is called the balcony of Pelion because it overlooks the entire Gulf of Volos. On the way to the main square, there are a lot of challenges in form of sweet fruit syrups and liqueur that you can buy in tiny souvenir shops. We loved sweet chestnuts and local honey which indicates that Pelion bees must be happiest bees in the world. The houses are built in traditional style with stone roofs and of course, there are plane trees at central square like in all others villages. But the plane tree in Makrynitza is different from all others because it has a big hole. Children loved it, playing as if it was their secret tree house. Tsagarada is probably the most popular village in Pelion. 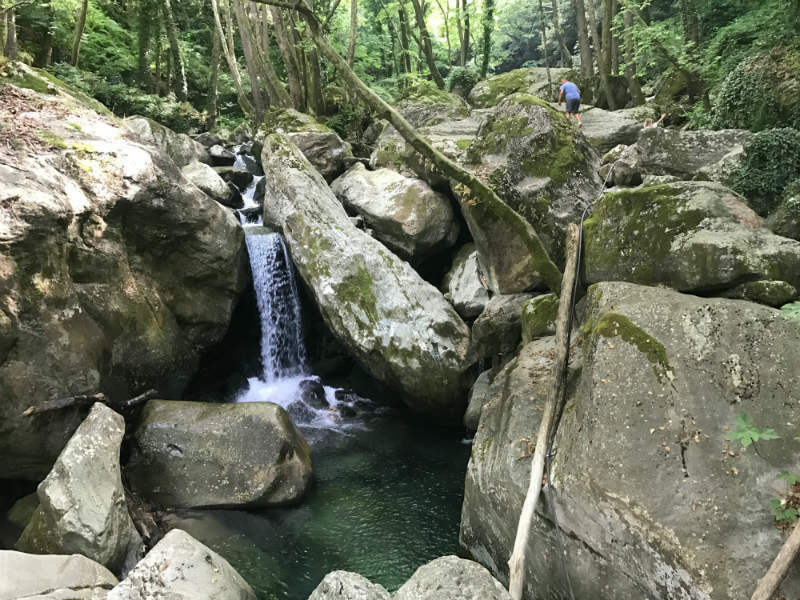 It is very close to everything, lush forests with strings and waterfalls and the most beautiful beaches in the area: Mylopotamus and Fakistra Beach. Tsagarada is boasting the thousand years old plane tree which offers shade all over the square so you can enjoy your lemonade while kids are overhead. Miles is a lovely village with traditionally build houses and rich history, but the main reason why people keep coming here is a train. In Milies is the last railway station of an unusual tourist train. It is a traditional and old machine which looks like museum exponent but it really works. It was designed by Evaristo De Chirico, father of the renowned painter Giorgio De Chirico. Nowadays, it is used for tourists to have a slow and easy ride with a magnificent view over the bay, forests, old bridges, and tunnels. The best part of the trip is when the engineer tells the tourists to help him turn the train back, so children can boast that they were driving a train. Kissos is a traditional village on the east side of Pilion, known as a good place for hiking. This village is especially rich in platinum and chestnut trees. On the main square is the Basilica of Agia Marina with rare golden frescos all over the walls and ceiling, wonderful carvings, and beautiful old icons. Zagora is the largest village of Pelion Mountain. Traditional architecture from the 17th and 18th century, Byzantine monuments, an old church with unique iconostasis and amazing views of the sea, this is what makes this village attractive to tourists. We were attracted by something else too. This place is famous for its variety of fruits, such as apples, plums, strawberries, pears … Reall fruit heaven! We arrived when it was a season of the cherries, the sweetest we have eaten. Vizitsa is a small, traditional village surrounded by forests. On the main street, there is the monastery of Agios Ioannis and the chapel of Zoodochos Pighi, built in the 18th century. Children want to light up candles in every church on the way so they didn’t miss this chance too. On the main square, there is a fountain and a huge plane tree, which covers the whole square with thousands of years long branches. The atmosphere is meditative and relaxed so that authentic energy makes you feel like in another dimension for a moment. Portaria is traditional village surrounded with lush forests and in one of them, there is a famous Centaurs path. Children were delighted when we told them that we go to find some centaurs. Centaurs were mythological creatures half-hose, half-men who had some supernatural powers. The most famous centaur was Hiron who was intelligent, civilized and kind. We followed “centaurs traces” walking for about 40 minutes. Where have they gone, it was left to the imagination. We visited 9 villages, but if you have time to explore all of them, you can find out about 20 Pelion Villages at Greeka.com. The entire eastern coast of Pilion has paradise beaches, and Milopotamos is one of the most picturesque and most visited beaches on the peninsula. The beach has a large parking lot, and you easily get to the beach with stone stairs. The Milipotamos beach has two small bays, and there is a stone tunnel between them. When you pass through it you arrive at another beach that is even more beautiful than the previous one. There is a small tunnel in the water, through which children love to swim between the two beaches. The sea is beautiful turquoise, with fine pebbles. The beaches are surrounded by large cliffs so there is a lot of shade. On the smaller beach, there is a huge cave, where you can get away from the sun as a prehistoric man. You can take a fridge (as most of Greek do) and stay all day there or go to the bar above the beach where you can enjoy great pizza-sandwiches and various types of fresh juices. Fakistra is another beautiful beach located near Agios Ioannis on Pelion. On the north side of the beach, there are two important historical caves. One is the cave of Panagia Megalomata, full of stalactites that go a few meters in height, and the other is Krifo Scholio, in which during the occupation of Turkey there was an illegal school. We are sure that the students of the secret school wanted to swim on this magical beach rather than learn. Like any true beauty, this beach is more difficult to reach. It takes only 10 minutes walk but the path is partly steep and slippery so it is better to take off shoes. When you see the turquoise sea and the waterfall instead of the shower you will see that the effort paid off. Namely, the waterfall is not always there. It depends on how rainy the weather was. Everything has a good and bad side. Heavy rain has ruined many roads in Pelion this year, but it also created beautiful waterfalls. Just cross a small bridge from Agios Ioannis and you are on long Papa Nero Beach. White sand and turquoise sea. The only downside is the lack of natural shade, but there are all other possible beach facilities. Along the beach, there is a lovely promenade that will take in another dimension if you breathe deep and listen to the waves, or it will take you to the city center with numerous shops and tavernas. Children gave their artistic contribution to the ambiance by making figures of stones. It looked like an open-air exhibition. Well, if they are not talented in art, they could learn physics this way. Sometimes we wonder why God does something, but it is perfectly clear why the Greek gods chose Pelion for their holidays. It’s just not clear to me why they went back to Olimp at all. Unlike Greek gods, many who come once in Pelion, decide to buy a house and stay forever. One of them is Jill Sleeman, a lady from England who fell in love with Pelion 30 years ago and bought a house in Mouressi village. She runs an authentic guest house (The old silk store) with lovely garden and delicious breakfast using local produce that is around at the time and some special things that are not so easy to find anywhere. Another lady who decided to spend the rest of her life in Pelion is Doris Schlepper from Germany. She bought a 300 hundred years old house nearby Tsagarada and created a magical garden around. This unique mosaic of fragrances and colors became a real attraction for tourists. Garden is filled with rare plants and trees, historic roses, decorated with fountains, and ponds, lined with stone walls and crisscrossed with paths. This unique mosaic of fragrances and colors became a real attraction for tourists. Garden is filled with rare plants and trees, historic roses, decorated with fountains, and ponds, lined with stone walls and crisscrossed with paths. She refuses to use herbicides and pesticides and she tries to attract more wildlife, so some snakes are welcome guests in her garden to do their job. The entrance to the garden is not changed, but donations are always welcome. You can also buy her delicious homemade jams. If you will be around, feel free to call her and visit.